If we use the word "manage," we receive angry messages that state, "You don't 'manage' volunteers! Don't you know anything?" If we use the word "engage," we receive messages with the question, "Will YourVolunteers help us to manage volunteers?" Both opinions are valid so allow us to cover our bases: YourVolunteers will help you to manage or engage or administer or supervise or advocate for or oversee or operate with or superintend or minister or captain or enlist or appoint or place or employ volunteers. 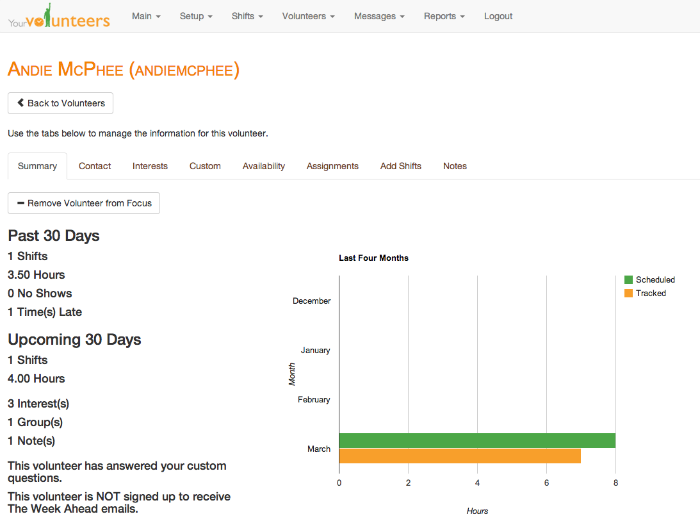 A cloud-based volunteer management system allows your volunteers to login and keep their information updated. Otherwise, a volunteer would need to contact you and you would then need to be the one to update their information in your database system or, if you don't have one, your spreadsheet (gasp!). Here's a secret that most Internet companies will not tell you: sending emails from web servers often fail. Some email services will have server-level junk email filters that will have rules like, "if it's an email, block it." These emails do not get to your junk email filter - they are blocked at the server and we get a message from your provider that says, "Your message cannot be delivered because we are evil and there is not a thing that you can do about it. Mu-ha-ha." If you have important emails that really need to get through to your volunteers, you should send it from your own email program. We offer a feature to allow you to filter and then build email lists that can be copied and pasted into your program. If you have a lot of volunteers and you are not able to remember everything about them, you are able to add notes about them that can be shared between volunteer managers. These notes cannot be viewed by the volunteers themselves. For example, you can create a note that says, "Volunteer is a filing machine!" and all managers will know. YourVolunteers has a built in feature allowing you to create messages that will be seen when the volunteers login. In a world full of people with their faces in their phones and tablets, it may be hard to believe, but not everyone checks their email every minute of every day so this ensures that the message gets through assuming that the volunteers login often. Also, if they subscribe to The Week Ahead emails, the messages will be included there as well.